In the last few months I’ve picked up a fair few games for myself, as well as being given some. I’ve only just started catching up on this backlog, and the first one I started with was Capcom’s Remember Me. Remember Me is set in Neo-Paris, year 2084. In this timeline, memories can be stored digitally, medically traded and sold. This commodification led to the introduction of Memory Hunters, elite agents who can steal memories; Memorize, a corporation using memory hunters to create a 1984-style surveillance state; and Errorists, a rebel alliance formed to take down Memorize. RM is described as an action-adventure game, though in play it turns out to be a bit of everything- there’s combat, puzzles, stealth, collectibles, hacking, acrobatics, and even more combat. The combat makes it very easy to see its a Capcom game, and its more involving than a typical action-adventure game- combos are built from unlocked special abilities (Pressens), meaning you can choose how you build your combos, speccing for increased damage, the ability to cooldown special abilities more quickly, or to regenerate health. However, even though you choose what abilities the combos have, what buttons are used cannot be changed- and seeing as the two combos given for the majority of the game are X-X-X and Y-X-Y-X-Y, actually using them is still quite repetitive. A very nice touch during combat is the background music, which turns from ambient noise to techno-ish when enemies appear, and also is at least partly linked to your fighting performance, getting louder when you land the last hit of a combo. I played it through on the lowest difficulty “Script Kiddie”, so I could document and take photos at the same time- despite that, I still lost quite a few of the fights. However, the game is very forgiving in terms of reloading the game at frequent and appropriate points meaning there’s never too much backtracking. Also, it can be reloaded from the last checkpoint at any point, making it easy to catch anything missed such as collectible upgrades and memory searches. Experienced gamers probably won’t find the actual adventuring difficult, as the game is very linear in terms of progression: each next movement is highlighted with direction arrows, and the correct technique for solving each puzzle (overloading the electronics; climbing; parkouring; activating lifts or cranes etc). This may annoy people who like very sandboxy games. However, the linearity is arguably necessary; there are so many actions you can use within the control scheme that making the game less linear would make it very difficult to take all of those options into account. To do it properly would end up making the game appear to promise non-linearity but not deliver it, so it is probably better to be linear upfront. It is also quite nicely built into the game, by virtue of the character’s memory port being equipped with a augmented reality overlay that provides information about their location and other people. This may be one of the few games where warning signs about in-game dangers actually adds to the environment. One of the main draws of the game is the memory remix sessions. I love these, as its a really interesting way of doing puzzle gaming, and a good way of getting character development for people without much screentime that doesn’t involve forcing exposition where it wouldn’t fit. They’re also quite a meta-gaming concept, as the memories are edited by looking through them and watching for visual glitches, then interacting with the glitched areas to change the correct ones… sort of like in-memory beta-testing. Considering I’m very good at causing glitches, I’m not quite as good at spotting intentional ones. The glitch theme is also present in other parts of the game: Nilin can use a special move called the Sensen DOS that overloads all electronically-based enemies, sort of giving them a Blue Screen of Death. Also, in the same way that many current games use a monochromatic or hue effect to represent injury and death, RM uses a glitch effect- when Nilin is injured, visual tears and interference patterns will appear at the side of the screen as well it going slightly red, expanding to the whole screen when she nears death. Speaking of graphics, RM is graphically impressive, such as the example screenshot below. Characters such as the ones in the top picture, are well-designed. I also haven’t seen any clipping or unintentional visual glitches during the time I’ve been playing. Visual effects for memory interactions such as remixes and remembranes are solid without being too distracting. The remembranes (“ghosts” of characters walking through a particular part of the story, opening doors or navigating paths that Nilin would not have known about) are an interesting part of the story, which haven’t quite been used to their full potential. 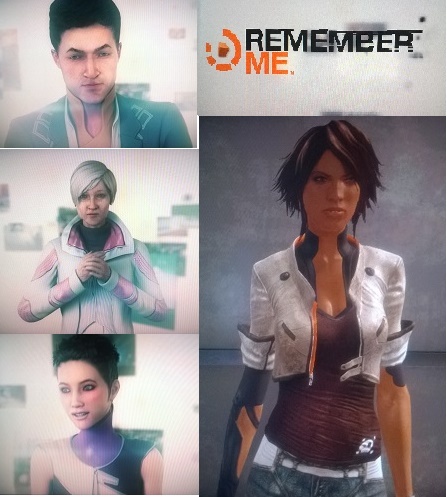 While they are a good way to add character interaction into what could otherwise have been a very lonely game, their short spawn time (averaging about 5-10 seconds) and the fact that synchronising the remembranes with Nilin’s memory (to make the walkthrough last longer, or keep an ability active) doesn’t always work as it should, means it can be frustrating to have to keep running back and restarting the remembranes, especially when you’re in a dangerous situation that means running back is difficult. However, they are a useful idea though, and another way of making the game stand out from action-adventure games with similar gameplay. Remember Me reminds me of Mirror’s Edge in some ways, as Nilin is similar to Faith in both character and design. There are also some ME-type movements such as wall-jumping, and ledge vaulting, but to nowhere near the same extent. Nilin is also similar in character development to Lara Croft in the Tomb Raider reboot, as she goes from overwhelmed to incredibly competent in a very short time- although that is probably due to Nilin only having to remember her past self, rather than learning it afresh like Lara Croft did. 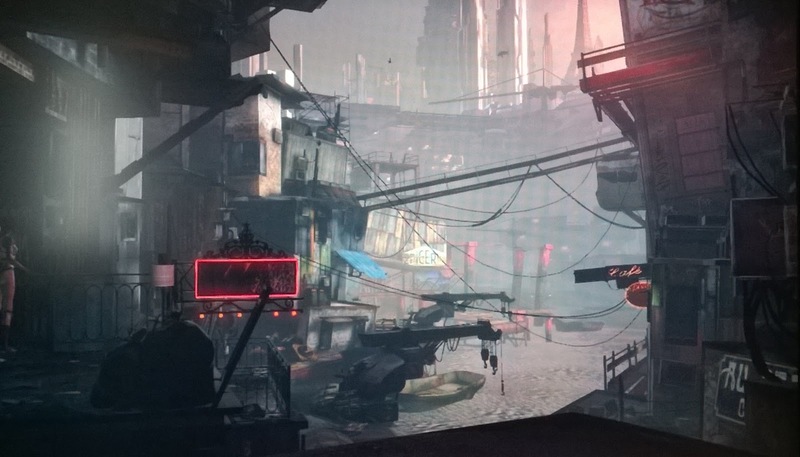 The atmosphere and design could be described as the other side of the coin from Mirror’s Edge too: cyberpunk as opposed to post-cyberpunk, and focusing on the underdogs and sewers rather than sterile rooftops. One of the things I love about playing new games is when you can see little elements of other games and how they influence the current game, without plagiarising or being repetitive. In the same way as the The Wolf Among Us mixed small parts of familiar games but was still original, Remember Me combines what could be an incredibly clichéd story [An amnesiac hero(ine) remembering only their name is guided by an unknown voice they irrationally trust, which tells them they are chosen and the only ones able to achieve their task. To achieve it, they must discover family secrets and clues to their identity], with enough new mechanics and enough style to hold its own as a great game. Overall, I’d say that unless you absolutely dislike repetitive combat, or can’t stand games without guns, this is definitely a good one to play. Developer-Fan Interactions: What can go wrong?